WASHINGTON, D.C. -- Americans' support for the tax changes signed into law by President Donald Trump late last year has edged up to 39% from 33% in January and 29% in December before the bill was passed. But more Americans continue to disapprove than approve of the law. The results are based on a Feb. 26-March 4 Gallup poll, the first taken after many organizations began to lower income tax withholding in worker paychecks. Trump touted the law in his Jan. 30 State of the Union address, and leaders in both parties have made the tax cuts an issue in this midterm election year. 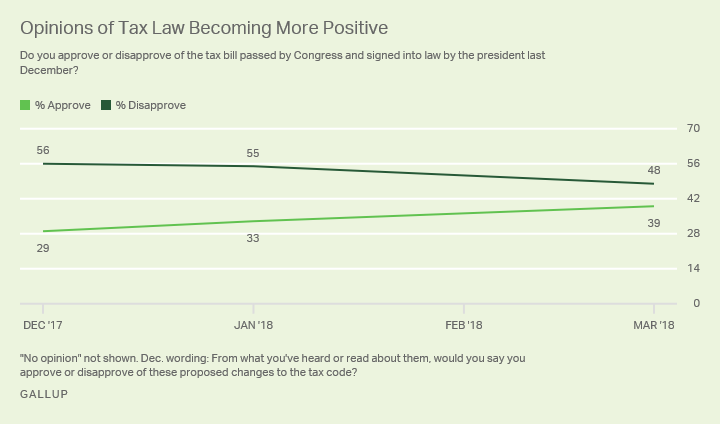 While these events may have had some effect, none of these developments has fundamentally changed Americans' more negative than positive opinions of the tax law. Opinions of the law remain sharply divided along party lines, although both Democrats and Republicans are at least somewhat more positive toward the law now than they were in recent months. Currently, 80% of Republicans and Republican-leaning independents approve of the law, up seven percentage points from January and a total of 15 points since December. The 11% of Democrats and Democratic leaners who approve is up slightly from 8% in January and 6% in December. Many companies began implementing the tax withholding changes pertaining to the new law in early February, resulting in larger paychecks for some workers. Separately, other employers gave one-time bonuses to employees tied to the corporate tax cut. Overall, 32% of U.S. adults say they have seen an increase in their take-home pay because less federal income tax is being taken out, while 64% have not. Thirty-five percent of working-age adults (under age 65) report seeing more money in their checks. 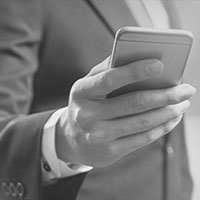 Upper-income Americans more commonly report noticing the tax savings than middle- or lower-income Americans -- 46% of those whose annual household income is $90,000 or more, versus 29% of those whose income is less than that, say they have seen an increase in their take-home pay. The perceived impact of the tax changes on Americans' finances appears to be fairly modest thus far. Among those who have seen an increase in take-home pay, 18% say it has helped their financial situation a lot, 47% say it has helped a little and 35% say it has not helped. Among all U.S. adults, 21% say the tax changes have helped them, including 6% who say they have helped a lot and 15% a little. Have you recently seen an increase in your take-home pay because less federal income tax is being taken out of your pay? (If seen an increase:) So far, has the increase in take-home pay helped your financial situation, or not? (If helped:) Has it helped a lot, or a little? Americans who have noticed an increase in their pay are more positive about the law than those who have not seen an increase, 61% vs. 29% respectively. However, this difference is mostly because the law's supporters -- namely, Republicans -- are more likely than its opponents to report seeing an increase in their paychecks. More than twice as many Republicans as Democrats report seeing an increase in their take-home pay, 48% to 22%. This sizable party difference persists even when taking into account a respondent's annual household income, indicating is it not a function of Republicans disproportionately receiving tax cuts because they tend to be higher-income. There is a modest relationship between reports of seeing an increase in take-home pay and approval of the law after the effects of party affiliation are taken into account. Democrats who report seeing a pay increase are more positive about the law than Democrats who have not seen one -- 17% to 10%. Likewise, 90% of Republicans who have seen an increase approve of the law, compared with 71% of Republicans who have not. House Speaker Paul Ryan predicted that Americans' views of the tax law would change after they saw its effects in the form of slightly larger paychecks. His prediction turned out to be correct, but probably not to the extent he and other GOP leaders had hoped, given that more Americans still disapprove than approve of the law. With eight months to go before the elections, however, there is still time for the law's support to grow to help Republicans. So far, only one in three Americans say they have seen a change in their pay from the law, and only one in five say the changes have had a positive impact on their finances. In the months ahead, more workers may see the impact as more employers implement changes to tax withholding. It is also possible some Americans are postponing judgment about the bill until they see the true impact on their taxes when they file their 2018 income taxes next year. Others, namely Democrats, may simply refuse to acknowledge any positive impact of the law on their financial situation because of their opposition to it, something that would be unlikely to change between now and the midterm elections. 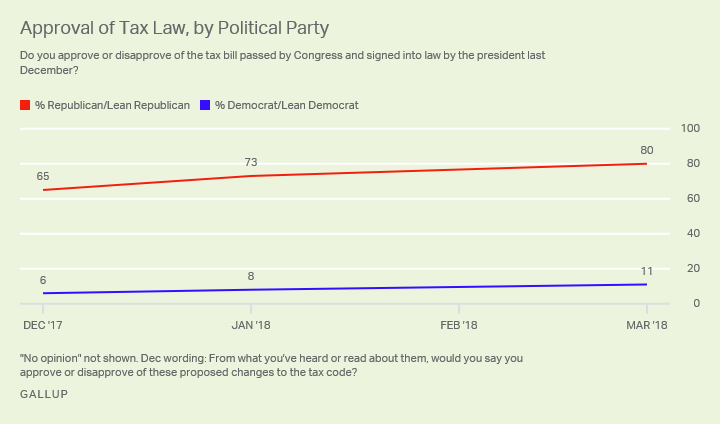 With eight in 10 Republicans and Republican leaners currently approving of the tax cuts, there may be limits on how much support for the law can grow unless Democrats and Democratic leaners change their opinions. If Americans overall remain more negative than positive about the law, the GOP may have difficulty using it as justification for why voters should keep Republicans as the majority party in Congress. Results for this Gallup poll are based on telephone interviews conducted Feb. 26-March 4, 2018, on the Gallup U.S. Poll, with a random sample of 1,509 adults, aged 18 and older, living in all 50 U.S. states and the District of Columbia. For results based on the total sample of national adults, the margin of sampling error is ±3 percentage points at the 95% confidence level. All reported margins of sampling error include computed design effects for weighting.